What’s big, bright and probably completely useless? If you guessed homepage sliders, you are correct. That’s right folks, today we’re going to tackle one of the most popular requests we receive from our clients and the controversy associated with it. Read on to learn about the pros and cons of choosing this popular design element. Between fixed operations, new and used sales, there’s a lot going on at your dealership. Your Service Department is offering a wheel alignment special, the Parts Department is running their yearly tire rebate incentive, the OEM’s year-end clearout event is on for New Vehicles and your Pre-Owned Department is waiving their delivery fee this month. Sound familiar? It takes a lot more work to conduct thorough demographic research and set up functional funnels on your site than it does to upload a shiny new slider. Adding a slider or carousel can make you feel like you’ve accomplished something, but in reality, it does nothing to reach (or engage with) your target audience. You need to roll up your sleeves a little bit to position yourself in front of those who are interested in buying what you’re selling. The old adage “nothing worth doing is ever easy” applies here. Perhaps you’re more of a follower than a leader. We’re not here to judge, but we will advise: in a world where everyone and their cousin has a website, including your competitors, it’s good to stand out. But you want to make sure you’re standing out for the right reasons. That “exciting” slider graphic is probably not what you want to be remembered for. You can do better! Tacky graphics are soooo last season. Have you ever tried to visit a website, only for it to take ages for a page to load? There are many factors that affect site speed, but graphics is a big one, particularly if you have several large files that need to load all at once. Slow site speeds increase bounce rates, decrease the quality of your user's experience and make puppies cry. Do you want to make puppies cry? DO YOU? When is the last time you landed on a homepage and waited around to watch all of the sliders cycle through? Probably never. 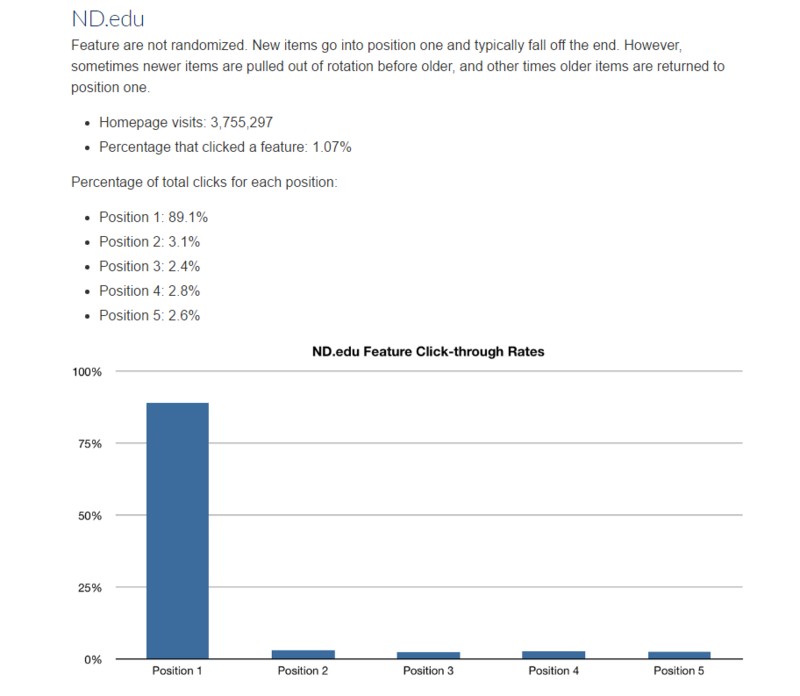 A study conducted by Erik Runyon found that out of 3,755,297 homepage visits on ND.edu, only 1.07% of visitors clicked on the slider feature at all. Of that, 89.1% of the clicks were on the first image in the slider. If only one percent of all visitors are engaging with this feature, there’s probably something more compelling you could put in this highly valuable location on your site. Jakob Nielsen wanted to see if banner blindness was real, so he conducted an experiment. He put participants to the test by asking them to determine whether Siemens had any specials on washing machines. Despite having not one, but two separate banners on the homepage, one of which took up the majority of the page, users did not pass the test. He concludes that “the worst offense is probably in making something move that should be static”. Enough said. Okay, okay, so the pros weren’t really pros. But at FlexDealer, our mission is to help dealers attract, engage and convert more qualified vehicle shoppers. Homepage sliders simply won’t help you achieve those goals. Yes, we know, they can be pretty… but we implore you to consider alternatives. If you’re not sure where to start, drop us a line. We’d love to work with you to create something awesome.